Make the dirt or asphalt scream for mercy with our mammoth selection of circle track drivetrain components. 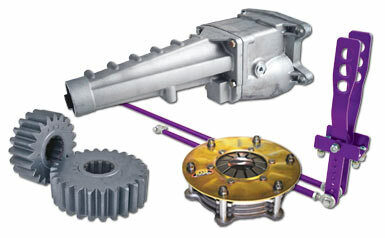 We’ve got everything you need to transfer maximum power to the wheels, including automatic and manual transmissions, clutches, driveshafts, axles, rear-end components and housings, ring and pinion gears, shifters, and much more. Your drivetrain is only as strong as its weakest link, so shop our lineup of tough, durable drivetrain components from the best brands in circle track racing—no weak links!